It doesn’t make sense if any blog or content is published in the absence of placing adequate keywords. Many bloggers or site owners who do not include keywords do such a big mistake in terms of SEO ranking. Google keyword ranking is such a vital step to grab your site’s position for instance, where your site is standing in Google pages. Until you use keywords in your blogs, you may not be able to know your site ranking. Keyword research process takes chunks of time using Google keyword planner that help you out in finding the relevant keywords to your blogs and articles. As soon as you finish your keywords research and placing them in your contents, your next step goes to keep an eye on tracking Keyword ranking. In order to improve your site ranking, only those keywords you must use that can help you out to boost your web pages on the first page of Google search engine. Moonsy keyword rank checker tool comes with great features whereby you can check your keyword rank with complete chart representation. You can test the same keyword for more than one domain. It’s easy in use. All you need to type the targeted keyword and domain name in order to gain the position of your keyword along with the analysis report with print and download features. 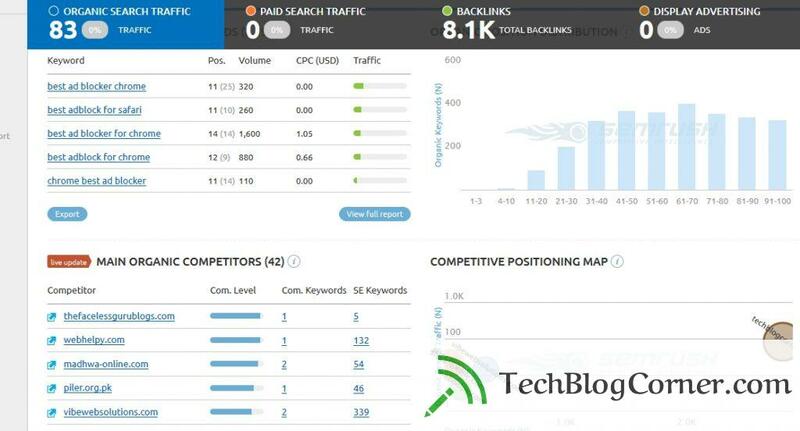 SEMrush is one of the most popular keyword checker tools that is used by the professionals. It’s not available for free use. 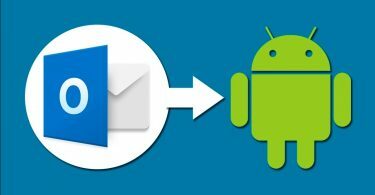 One who wants to use it needs to subscribe its paid plan although one can also avail the trial option. 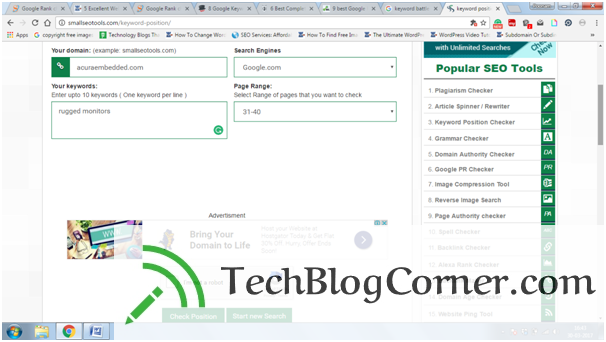 In order to find keyword ranking, you need to provide the site URL or individual blog URL and this will show you the keyword position along with keyword competition as it acts as a keyword ranking tool as well as page rank checker. 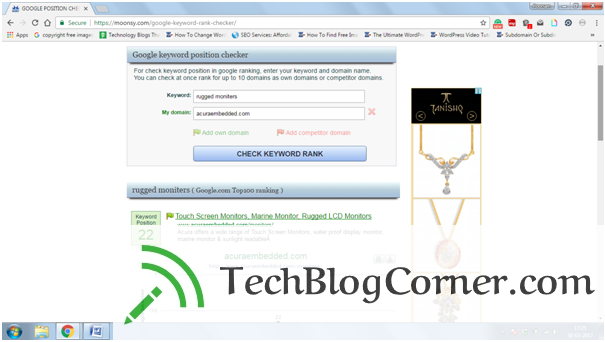 It also tells you what keyword is working well to rank your site. 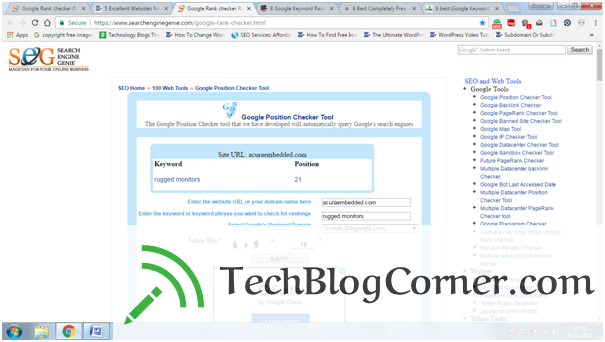 Google rank checker is a tool that is launched by the Google itself. By using this keyword rank checker you can track the exact keyword positions. It’s totally free to use hence, you can check your keyword ranking on regular basis for better site ranking. Here, you will be asked your domain or website name and keyword you want to check for ranking. In a result, you will get the ranking for your keyword instantly. With the use of Small SEO Tools, you are allowed getting free keyword ranking report in just one click by entering your website URL and targeting keyword. This tool can be availed with no charge in order to track your keyword position and keyword ranking. But the limitation of this tool doesn’t allow you to check your keyword ranking if it goes at the range of pages that is 40. 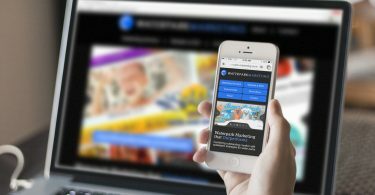 Keyword Battle is such a better keyword ranking tool that enables the webmasters to check the keyword ranking of their website as well as their competitors’ websites. You just need to enter the website URL with targeted keyword and this will provide you the keyword ranking with position. Overall there are lots of free online tools to check your keyword ranking quickly and easily but we provided in 5 numbers. 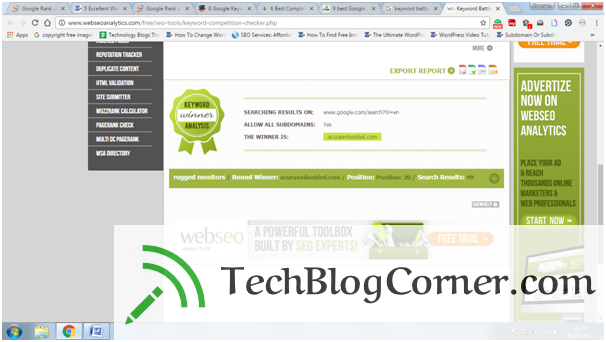 So, keep tracking your site ranking using these tools and improve your site by analyzed report.